Product #46135 | SKU TRAVIS | 0.0 (no ratings yet) Thanks for your rating! 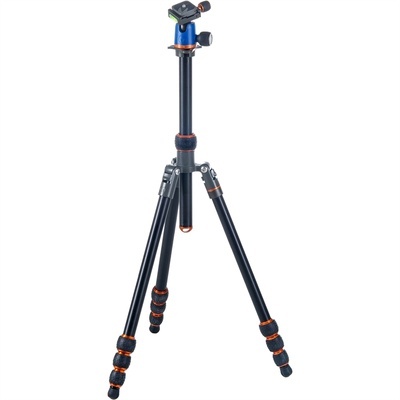 The Travis Aluminium Travel Tripod with AirHed Neo Ball Head from 3 Legged Thing is a four-section aluminium tripod which extends to a maximum height of 165.10cm and drops as low as 19.81cm. At the 23° angle leg spread, which is considered a normal stance, the tripod can support a maximum of 18kg, however, when the legs are set at the 55° and 80° stances they may support less weight. The implementation of rubber-coated twist locks is also a welcome addition, improving grip and protecting user's hands from a hot or cold aluminium surface. The single-section rapid centre column can be used upright or inverted, enabling the user to raise the tripod to any height, while using the centre column to make small adjustments. Folding the legs 180° in reverse allows the user to make the tripod more compact for travel or storage. As is common with 3 Legged Thing tripods, the Travis features a detachable leg with standard 3/8"-16 threads at both ends. The Tri-mount centre column plate and threaded bolt can be unscrewed and removed from the top of the centre column, then screwed directly onto the leg. The detachable leg can be used as a monopod, microphone boom, or selfie stick depending on the needs of the user.